More and more, first- year writing courses foreground skills of critical analysis and argumentation. In response, A Brief Guide to Arguing about Literature first hones students’ analytical skills through instruction in close critical reading of texts; then, it shows them how to turn their reading into well-supported and rhetorically effective argumentative writing. 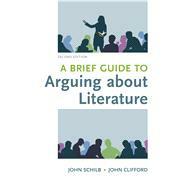 For instructors who prefer to aggregate their own anthology of readings and literary works for their literature-based composition courses, A Brief Guide to Arguing about Literature comprises only the writing-guide chapters of John Schilb and John Clifford’s admired Arguing about Literature: Guide and Reader. In response to reviewer suggestions, this new edition of A Brief Guide to Arguing about Literature includes even more instruction in the key skills of argumentation, critical reading, and research than its predecessor. John Clifford (PhD, New York University) is a professor of English at the University of North Carolina at Wilmington. Editor of The Experience of Reading: Louis Rosenblatt and Reader-Response Theory, he has published numerous scholarly articles on pedagogy, critical theory, and composition theory, most recently in College English; Relations, Locations, Positions: Composition Theory for Writing Teachers; and in The Norton Book of Composition Studies.